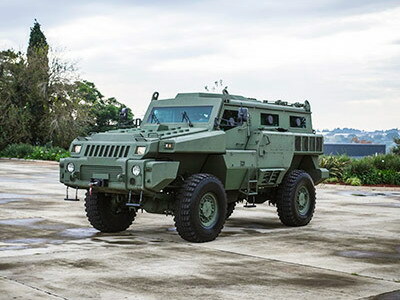 Nigeria is a new customer for Paramount Group’s Marauder armoured vehicle, with the type having being delivered a few weeks ago. News of the type in Nigerian service came after a photo surfaced online showing three Nigerian soldiers with a single Marauder in the background. A subsequent photo showed two Marauders with personnel at an admin building. In the first photo the vehicle is fitted with what appears to be a King Abdullah Design and Development Bureau (KADDB) Snake Head turret. Paramount and Jordan’s KADDB have worked together on vehicles in the past, with KADDB fitting its turrets to a number of Paramount vehicles, including the Mbombe. Nigeria is understood to have taken delivery of a first batch of Marauders, which could be supplemented with additional orders following the use by the Nigerian Air Force. Driver and maintenance training have been successfully completed. The Marauder with its high levels of protection and mobility could add formidable capability to the armed forces in the fight gainst Boko Haram in the north of the country. Paramount has supplied Marauders to Algeria, Kazakhstan, Azerbaijan, the Republic of Congo, Malawi and Oman, amongst others. Singapore received the Belrex version. The 15 ton Marauder is an IED and mine protected vehicle that can carry of crew of ten and be configured as either a troop carrier or combat vehicle. In addition to blast protection the Marauder is fitted with a double-skinned hull throughout the cabin and crew compartment to protect it against kinetic attack up to STANAG 4569 Level III. Top speed is around 120 km/h.